By Marcus Stewart: Deontay Wilder’s record has without a doubt been massaged and this has been proved as he takes on another soft touch in Damon McCreary. It’s disappointing considering that Wilder called out fast rising heavyweight prospect Tyson Fury. It’s a bit contradictory for Wilder to be calling out someone as gifted as Fury to then end up finding himself fighting against unknown heavyweight Damon McCreary. The only reason McCreary looks like a threat is because he’s undefeated like Wilder; however everyone knows that he’s a 2nd tier fighter. 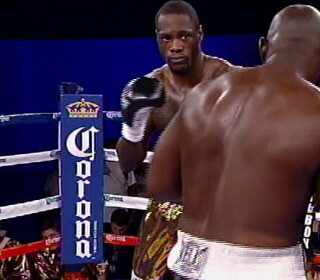 Deontay Wilder was quoted as saying to fighthype.com “I want Tyson Fury. I’ve been calling him out on Twitter. People want to see me fight the best so once his name came up on my hit list I called him out.” Pathetic. The fact that Tyson Fury is ranked #7 by the WBC and Wilder is ranked just inside the top 50 just shows to you the gulf in class between these two fighters. I have to confess that Deontay Wilder has got good power, however he wouldn’t be able to contend with the power and skills that Tyson Fury possesses who is without a doubt the better of the two fighters. In my eyes I can’t see this fight lasting long as I can imagine Wilder hitting the canvas heavily at some point within the first 5 rounds. Deontay Wilder has fought nothing more than mediocre regional level fighters, whereby he’s been able to showcase his punching power, hence his massaged record which makes him look like a beast when he’s anything but that. If he were to get into the ring with Tyson Fury, not only would he get totally out boxed but he would get completely brutalized by the much more talented Fury who I believe will be a world champion one day. Deontay Wilder vs. Tyson Fury is a fight that many people see as a 50/50 bout, but believe me if Deontay Wilder is to fight the beast that is Tyson Fury then he will find out the difference between average level opposition and world class opposition. His bout against McCreary will be a simple one as he’ll be fighting a C-level opponent who he’ll be able to knock around left right and centre, but I highly doubt that the “bronze bomber” will be able to do that against the talented Tyson Fury.